I was pretty good at math growing up in grade school, junior high and high school, but I never went beyond Algebra 2. In college, my ACT score allowed me to skip the general ed requirement for math, and my major was theater - no math required, or, I dare say, very few theater majors would ever graduate! I did graduate - sans college math. My dad was a mathematician and when he retired after 30 years in the research department at a major steel company, he told me he had been working on one math problem for 15 years, and retired before he'd finished it! I never could quite wrap my brain around a 15 year math equation. Fast forward to the recent past. 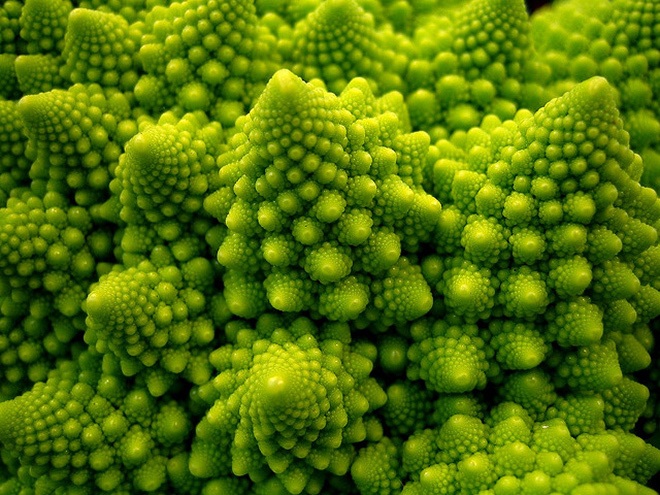 I kept hearing the word "fractal" and what I was hearing made me curious. So I looked it up on Google and found an episode of Nova that was all about fractals. I watched it. My understanding of the universe was suddenly expanded. Fractals are repeating patterns - that the closer you look at anything, you will see smaller and smaller versions of the exact same pattern, and it is a mathematical equation that replicates again and again - but the most amazing part of it is that fractals can be found everywhere in nature - some are obvious, like a fern leaf that is clearly evenly distributed, and some are very surprising - hidden in plain sight, like a coastline. They seem random, maybe even chaotic, totally unpredictable, but, in fact, they are totally predictable, they are mathematically exact. I'm not going to try to explain in a paragraph what they are, you can go watch the Nova episode and see what I am talking about if you don't already know - they do a much better job of explaining what fractals are. But the statement in the documentary that fractals are everywhere, made me stop and ask my own question, "is EVERYTHING a fractal?" As soon as I asked the question, it was like the top of my skull was removed and my brain expanded to fill the universe. Not being used to that sensation, I had to distract myself from the idea and come back down to my mundane little life. But every once in awhile I would let myself wonder for a moment or two about that question. Not to sound too woo-woo, but I am going to confess one of my pet obsessions. After my father died when I was 22, I found myself thinking a lot about death and what happens when we die. In time, I started hearing about and reading about people who had so called near-death experiences - NDEs - where they were clinically dead for some length of time, their spirits rose up out of their body and had some type of out of body experience, only to return as they were resucitated or revived and sooner or later recall and record as best they could, what they experienced. Part of why this captured my fancy was because some interesting things happened to me after my dad died, and reading about these NDEs helped me make sense of the things I had experienced in regards to my dad and feeling his presence or sensing him communicating with me through a dream, an old letter from him that kept resurfacing when I most needed to hear from him, or some other subtle but profound feeling or thought. I have a good sized collection of these written accounts that have been published over the years. If I hear about a new book, I will hunt it up and buy it. I have found some accounts online and even some video accounts that I find fascinating. Not too long ago, I got on YouTube and started watching some new ones I hadn't seen before. One particular one was a woman who said a heavenly messenger or guide, perhaps it was the Savior - I don't exactly recall - was showing her many things, and at some point, what she was shown was like a holographic mathematical equation - and unlike how she felt about math in her mortal life, in that sphere, she totally understood what the equation meant - and, in essence, it was that everything was math - everything in the universe was mathematical - was part of an equation. Again, I had that feeling I'd had after watching that show about fractals. Like the top of my skull hinged open and my mind expanded to fill the universe. I think it was the next day during my scripture study, the thought came to me that the plan of salvation is a math equation. I think most people are not math whizzes and do not feel comfortable with math beyond calculating a tip at a restaurant or balancing their checkbook, if they even do that. So the idea that the plan of salvation is a math equation has probably not been broached that often by gospel teachers. But suddenly, it made a great deal of sense to me. In fact, many scriptures came to my mind and took on a whole new meaning I had never recognized before. Such as, "Can mercy rob justice?" or "There is a law irrevocably decreed in heaven upon which all blessings are predicated," or "infinite atonement." What if it is because all things are mathematical - and all equations must be resolved? This thought felt like a major connection had been made in the puzzle of life. There is order, whether we see it or not at first glance or even after staring for a long time - there is order in the universe. Whether you look to the next higher level or the next smaller level - quantum level - either direction - there is order, aparent or not. Then I asked, is there any real chaos? And the thought came to me, yes - it was Lucifer's plan. It was bad math. It was an equation that would never resolve. It could never have worked. I thought, and this is just Debbi wanting to understand how a Son of the Morning could fall from grace, maybe at first he thought his equation was valid - cried - "EUREKA!" and started telling others about it. Then maybe someone, or maybe even he himself, rechecked the math and found a problem - but Lucifer was so filled with spiritual endorphins that he refused to accept that his plan was flawed and continued to preach it. Maybe he believed he was "above" math because the end result was so awesome - I don't know - but there was a moment when he knew he was lying and didn't care. The atonement is math. When we sin, our equation is altered and cannot be resolved to the desired outcome. Christ's atonement mathematically resolves our equation when we insert it, by choice, into our own. If we do not, the payment required is horrific, but it must be paid, till the math resolves in a hellish afterlife that continues till the end of the period of resurrection and the final outcome will vary, mathematically for each individual. Just now the idea of marriage being part of the mathematical equation became obvious. Why the highest degree of glory requires eternal marriage - a sealed man and woman - mathematically, that union, those combined equations will have a very different result when joined. It isn't some arbitrary rule God made up on a whim. Seeing this mathematical overlay changes how the socio-political banter of the day is like a child arguing with his math teacher that his equation "is too right" - no amount of tears, screaming and stomping his foot will change the errors in his math, nor his grade, unless the teacher is willing to lie. But it does not make his equation correct. Rant and rave and demand and posture and group into a mob all you want. 1 + 1 will never be 3. The whole world may decide it is - but it isn't. What good does lying about it do? None. Yet, God will not force us to believe it. We have the choice to fill in the blank however we want. 1 + 1 = ____ HOWEVER, your answer is either right or wrong. Period. The consequences are fixed. Math isn't fashionable and trendy like hair styles or politics. Like I said, I never went past Algebra 2 - but I wonder, and a mathematician may be able to explain yeah or nay - if there are do-overs. If after the whole equation plays itself out, we can take all our numbers and start over and try again in a new iteration of the equation. Like a round of chess. ROUND. Interesting word.